As the founder of National International Roofing (NIR), I like this quote for several reasons. First of all, this is truly the mentality that exists in the commercial and industrial roofing arena. Rooftops are often put on the backburner, as we take the structure above our heads for granted. But it also highlights a major disconnect that exists about roofs – which is that rooftops actually need the same amount of tender loving care you give to your lobbies or your courtyard gardens. And in order to prevent major rooftop problems, allow for effective budgeting, decrease the likelihood of roof emergencies and increase roof life expectancies, you need to regularly schedule your rooftop care. This is the major point I drive home in the book I recently published, The NIR Difference. As property owners and managers, it is vital that you view your roof as an asset to maintain and protect. Whether your roof is large or small, you cannot ignore the fact that it is a costly resource that shields your tenants and your internal structure from the elements. Furthermore, in a world with soaring fuel prices, you should take advantage of the positive ROI that proper roof maintenance never fails to yield. Don’t get stuck in a watery, costly venture by overlooking the asset that caps your building. A proactive approach in roof upkeep by both you and your team will prevent the roof idiom I mentioned from coming true. After 33 years of working in this industry, I was inspired to share information about the right and wrong ways to care for your rooftops. 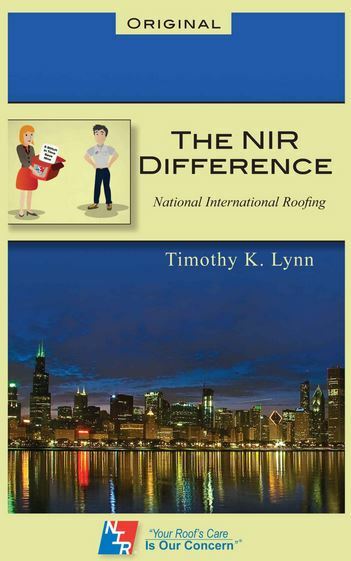 In just 45 pages, The NIR Difference will demonstrate how dedication to regularly scheduled roof care produces positive outcomes for both your building and your bottom line. You can relate the case studies in the book directly to your profession and pass what you learn onto your building staff. So what is the NIR difference? It is a belief and philosophy that starts with me and moves throughout my company. As a leader, I want everyone who works with me to know that I am passionate about what I do and the services NIR provides to customers. Roof maintenance is not some product we simply offer – it is the education we provide our employees and customers on a daily basis about their roofs and their livelihood. Mitigate leak occurrences by 72%. NIR will also work with you to prevent premature roof replacement and provide accurate budgeting for future roofing needs. If you would like to read The NIR Difference, please contact Scott Dvorak, NIR Vice President/COO, at sdvorak@nir.com. The first 50 BOMA/Chicago members who contact him about this blog will receive a free copy of my book, which can also be purchased on Amazon. Rooftop care starts with you. So don’t wait for the rain…be proactive and give your rooftops regular TLC.